Yesterday was another playoff day. After 3 finals losses in my last 2 playoff Saturdays, I was starting to wonder when it would happen again. I even thought, if it would happen again. I woke up yesterday morning at 6:45 for breakfast with some players at the rink. The games started at 8:30am and ended about 12 hours later. In that time, I played 3 games, but I was scheduled to play at least 3 if not 6. With the heat and fatigue playing a huge factor, I feel the only mistake I made was overscheduling myself. That would hit reality just after my first game. My first game of the day was with the Fury in Brass division against Biohazzard. In the division, our two teams were the closest match to each other which is why we finished 2 and 3 respectively in the division. The game was an intense one as Biohazzard lept out to a 3-1 lead at the end of the first half. I thought I played pretty well, but one player on Biohazzard put in all 3 goals on me and he has always been able to find my weak spots on me. Our team captain told me to keep them off the board the rest of the game and we will win the game 4-3. I smiled and nodded thinking I would do my best. We got another goal early in the second half, and then scored the game tying goal with under 2 minutes to go, at least that is what we thought. The game tying goal was called off due to a man in the crease. That got someone from our team kicked out for abuse of officials for yelling at the refs. With under 45 seconds and shorthanded, we got that game tying goal to send it into OT. The first OT went by fast with both teams having chances to win the game, but neither team could put the puck in the net. Another one of our teammates ended up leaving with an injury to his shoulder which brought our bench down from 9 to 7 guys total after the abuse of officials incident. That OT turned into a second OT. Fury finally found the back of the net about 10 minutes into the second OT when Weibs put it upstairs on Cody to finish the game 4-3. The entire team was estatic, but exhausted after such a long game. Probably one of the best saves I came up with in this game was a glove save off a breakaway chance. Pawlik, the forward converted to defenseman who got beat for that breakaway, was more than happy after that glove save. Personally, I thought I played very solid in that double OT game, especially as the game drew to a close. I was so damn tired after that game, I got another goalie to step in for me for the next game. I refused to do back to back games after a full 60+ minutes of hockey. Vintage Painting deserved to have a fresh goalie, so I gave them one. 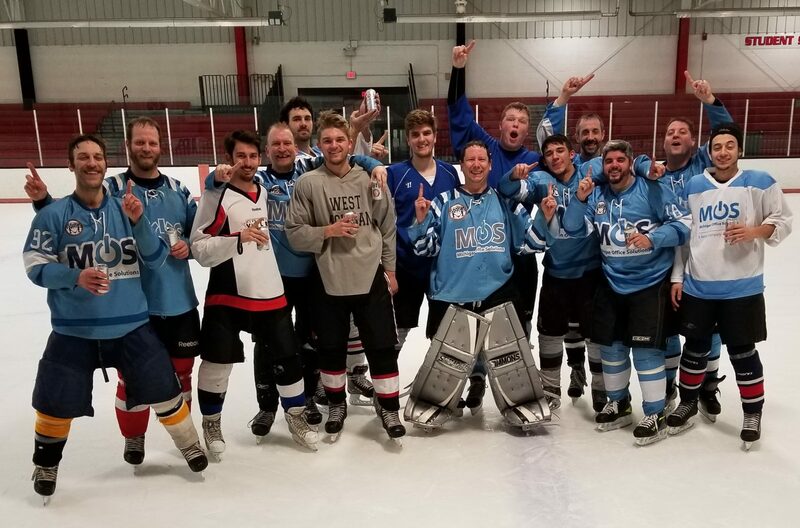 Vintage just couldn’t put goals up on the board as they were beat out in their first game by a score of 4-2 by the eventual champions. My next game was about a couple hours later when I played for Ionia Skateland. With no defense in front of me and no offense on that team, we folded very quickly by a 7-0 score. I thought I played decent considering the circumstances. I had about 4 hours before my finals game with the Fury, so I took the opportunity to get some food and rest. I talked hockey with Pawlik over lunch, and then sat in my air conditioned car and tried to snooze for a bit. That was hard to do though, with my expectations of the finals approaching. It was then that I decided to try this energy drink just before the Fury played called Full Throttle. I have never had one of these before, but I felt I needed it with my energy level low at the time. The first seed was the Black Dragons. A team that beat us 9-1 just the previous night and has dominated us through the regular season 2 times. We eneded up beating them once in the regular season, but by just one goal. Both sides were expected to not have their entire team. We lost one guy due to a billing problem late in the season. We also lost one due to injury and then the guy who got suspended as I previously mentioned. The Black Dragons were lacking one or two of their guys, which is much less than everyone expected. The core of their team was intact though and they had a lot of firepower. I played my strongest game in the finals game. At least that is what my entire team said. I was just seeing the puck so well I couldn’t miss making a save, and I had to make a lot of them. The Dragons were outshooting us by a good 2-1 margin at one point in the game. I stood my ground and was equal to each task. The game was tied 0-0 and I figured it was fitting if the game went to OT with both teams playing very well. With about a minute to go, Fury forward Justin Brinks put the puck upstairs on the goalie to make it 1-0. I just knew we had the game at that point. We scored an empty netter with 21 seconds left and controled the puck for the duration of the game. My teammates piled on top of me, did the trophy presentation, and then the fun really began. I was totally drained. I walked around the rink and just chatted with everyone. The entire team at one point in time carried the trophy around the rink. Personally, I was just happy I did it. With everything that happened with us losing 3 of our regular players. We really wanted a steady defenseman, but no one on our sub list would step in after our best defenseman left near the end of the season due to a billing dispute. Then, you had the injury and the suspension of the other 2. We went in on that finals game with less than our full roster, and acheived victory. I gathered at TGI Fridays for a late dinner and drinks. I got home at 1:40am and was in bed by 2am. 20+ hours up and playing. It was a long day, but an experience I won’t forget.